One of the aspects of Volley & Bayonet which I particularly enjoy is the ability to refight the great battles of the black powder period. Over the years I have indeed been fortunate to refight many of these famous battles, including many from the Napoleonic Wars. These include all those from the Hundred Days Campaign. Over the last week I’ve revisited the smaller battle of Wavre and twice resolved this battle on the table. First playing against Jim, who I unfortunately infrequently manage a Volley & Bayonet game against. You can find an account of the game here. Then more recently, we refought the battle as a multiplayer game during our usual Friday evening gaming slot. A report of this game can be found here. Both refights of course had similarities, yet each was different as players all approached the battles from a different perspective, each with their own views of what could be effective. Indeed at one point there was significant debate in the second refight between the two Prussian commanders who had very different styles – one deliberate and one more aggressive. Few rule sets produce a narrative which is so similar to these great battles. Yet the games don’t become bogged down with excessive detail. Indeed, as I’ve read accounts of the action at Wavre during the week I’m reminded of the similar narrative that could easily be applied to our refights. A fact that even after using these rules for over 23 years continues to fascinate me. A couple of photos from this evenings Volley & Bayonet game set in 1806. The French comprising Davout’s III Corps, reinforced by elements of Lefebvre’s Reserve Corps and not fully deployed, are caught by the advancing Prussians. While the French were of extremely high morale the numerically superior and concentrated Prussians and Saxons advanced with great élan. Above and below the French centre. The town was secured initially by Gudin’s Division that formed the French right. Morand’s Division eventually deployed to the left towards an area of cornfields. The disordered Prussian guns provoked a French attack, which unfortunately failed to achieve the hoped for dramatic breakthrough. Below, a view which shows the French right and centre. 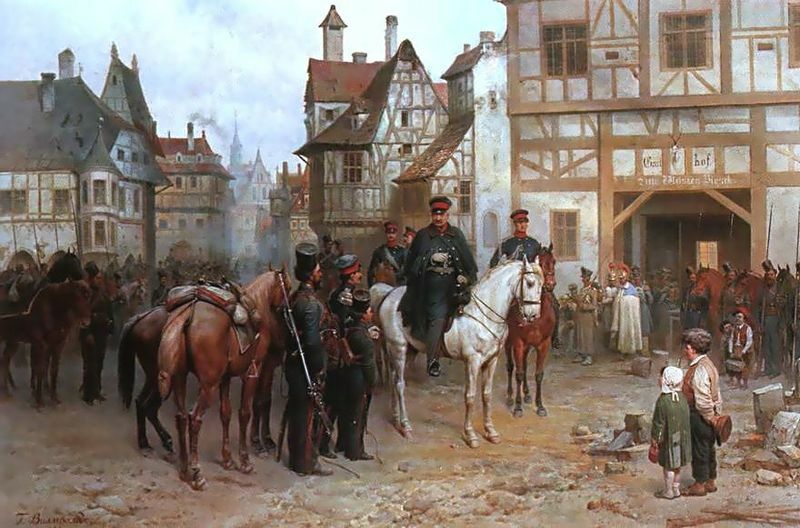 French cavalry, including Nansouty’s Heavy Cavalry Division in the forefound, was heavily outnumbered by Prussian cavalry. The French left eventually expanded to past the cornfields but was outflanked by Saxon cavalry and forced to retire. Below, just prior to retiring, Friant’s Division with Hulin’s Guard Division in the left foreground. However, the battle was decided in the centre where repeated French attacks were thrown back with heavy casualties. Indeed, Morand’s Division eventually collapsed after several hours of fighting. A truely fascinating encounter, but with a very different result than that at Auerstedt. 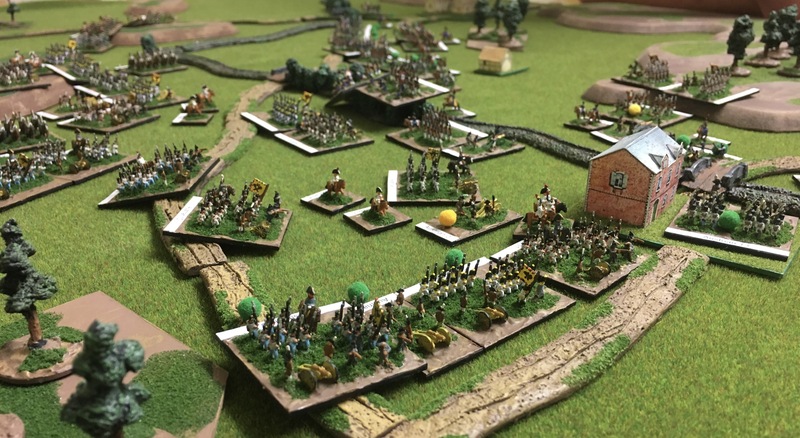 Last Friday evening found three of us deploying our armies for another 1813 game using Volley & Bayonet. 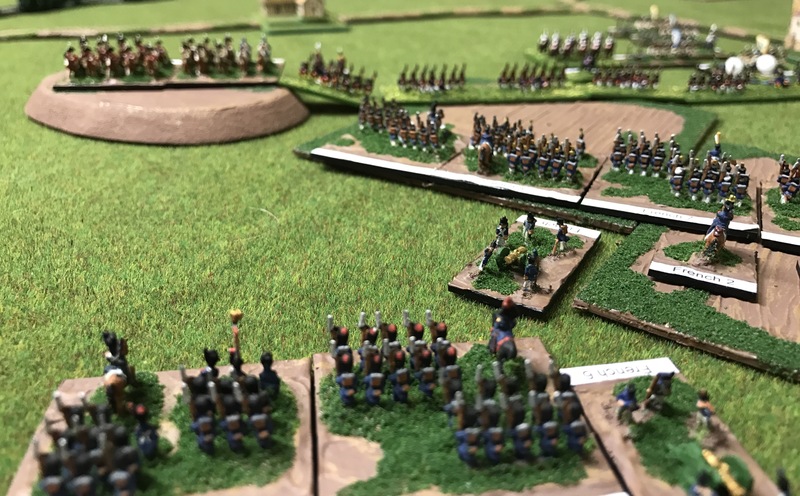 These days we often use the “Road to Glory” Scenario System to develop our Friday evening games and as always it produced an excellent battle. Having organised a couple of slightly larger armies, 4000 points rather than or typical 3000 points the armies were deployed. Ney commanded four corps which were opposed by two reinforced Austrian corps and a weak Prussian corps. Given the game a week prior was set in 1813 it seemed fitting to somehow link the two. A few photos of the game, as well as a brief summary, can be found here. 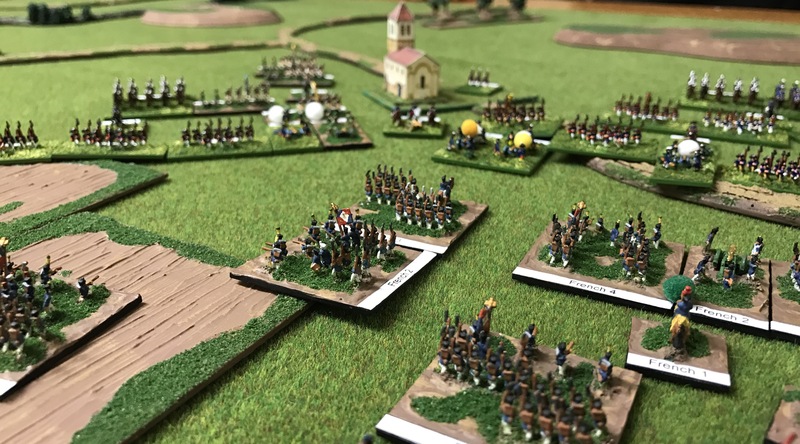 A very busy January has prevented any Volley & Bayonet so it was pleasing to finally be able to organise a multiplayer game for last Friday evening. I’ve been using Volley & Bayonet, across two versions, for well over 20 years. Yet every time I use them I’m reminded how much enjoyment they provide and how they create a game that follows the accounts of the great battles of the period. Dramatic events unfold as armies comprising multiple divisions and corps manoeuvre and clash on the table. We opted to use the Road to Glory System to develop the scenario with each army comprised of 3000 points of troops. With 1813 armies often comprising poorly drilled troops. Therefore even 3000 points can produce reasonable sized armies. I was particularly keen to deploy my Austrians and prepared for a dynamic engagement. I just hadn’t realised how dynamic the upcoming battle would be! 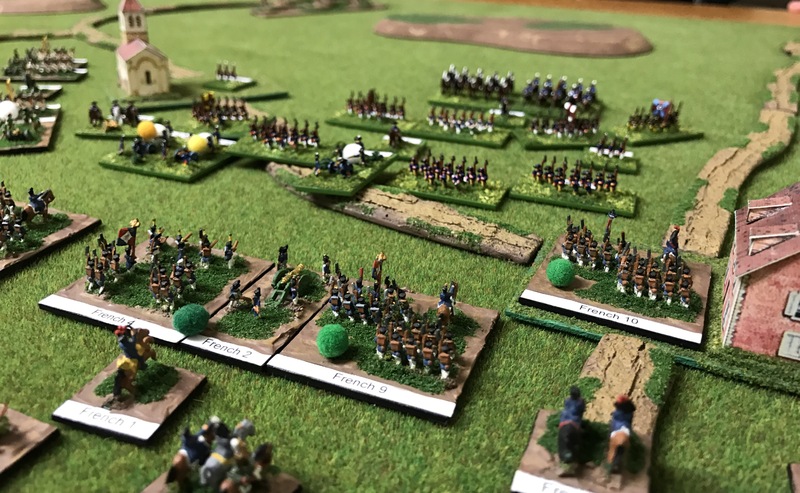 Easter is fast approaching and here we are planning a multi-player Napoleonic game set in August 1813 using the Volley and Bayonet rules and our 6mm figures. The hard-fought battles of Lützen and Bautzen are now long gone as is the brief armistice. Now in August, with the armistice over, the armies prepare to engage. Major battle currently looks likely to occur around the town of Hennersdorf somewhat east of Dresden and north of the Austrian border as both the French and Allied Coalition forces converge on Hennersdorf. To the south, and forming the Allied left wing, having crossed the Austrian border, are elements of the Austrian army under command of Prinz Schwarzenberg. From the east, and forming the Allied centre, march the Russians under Barclay de Tolly. Finally from the north, and the Allied right wing comes Blucher and his Prussians. 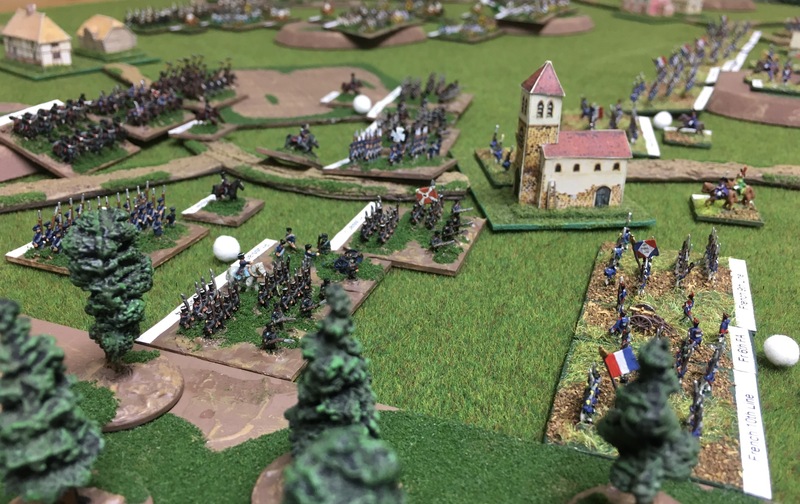 Meanwhile the French are marching in four columns and likewise aim to converge on Hennersdorf. Once all the forces converge well over 200,000 men will be engaged. With six players it promises to be an interesting day. Hopefully I will manage some photos and a brief report for The Volley & Bayonet Page.